In this ConversionCast™, we take a look at academic software and hardward eCommerce site Gradware.com, an academic software and hardware eCommerce site. What are the key strategies you want to get right if you’re running an eCommerce site? 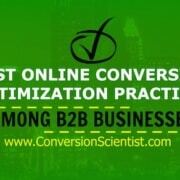 I offer my opinion in the workshop “Identifying Your Key Conversion Strategies,” which you can listen to free. You can also subscribe to The Conversion Scientist Podcast for more on conversion and Web strategy. For this ConversionCast, we don’t have the time to dive into the purchase process, so we’ve focused on the Home Page, Product Pages and Category Navigation. Tell us what your eCommerce site offers in the comments below. Hi Brian – great webcast – I really enjoyed how you laid out each step of the home page and product page. 1) I noticed the company had some kind of pseudo-chat tool. I think it said “Click here to leave a message”. Maybe it was chat, and it was after hours. Nonetheless, I feel that live chat is a HUGE factor in getting higher conversions, particularly with complex products. Rackspace/Mosso uses live chat to not only provide support, but to aid conversions, and it works very well. Depending on how this company staffs their chat, I would place more emphasis on that chat box to aid the customer. I have seen some chat boxes that float up and down the page, so you don’t lose site of them. What is your take on those? 2) I think there would be added benefit if each product had options for ratings and comments. When we see e-commerce pages with lots of product choices, we’re not always sure as to which one is best. So I think the way download.com, or newegg.com have their ratings and commenting system, could provide lots of added value to the site, and increase conversions. I agree with you about the Live Chat feature, especially for eCommerce sites. In Joe Pulizzi, and the folks at Be Greeted did a webinar that talked about the advantage of chat in the content cycle. You can view it here. Regarding ratings and reviews, you’ll see that Bazaarvoice, a provider of retail ratings and reviews solutions is using chat on their Web site. Having said all of this, there are a few strategies that you’ve got to get right, or the rest of this doesn’t matter. That is what I’m shooting for when I do a ConversionCast. I count on smart guys like you to fill in the rest. Great Conversion Cast, i really enjoy the way you break it down in a clear, easy for site owners to comprehend fashion. One rule that i like to follow is that everything should serve a purpose.. if they are going to go to the extent of adding that top navigation they should go the extra mile and really communicate the purpose of it.